Reconstruction and recovery of lost and deleted data. Is there a better alternative to UFS Explorer RAID Recovery? Is UFS Explorer RAID Recovery really the best app in File Management category? Will UFS Explorer RAID Recovery work good on macOS 10.13.4? 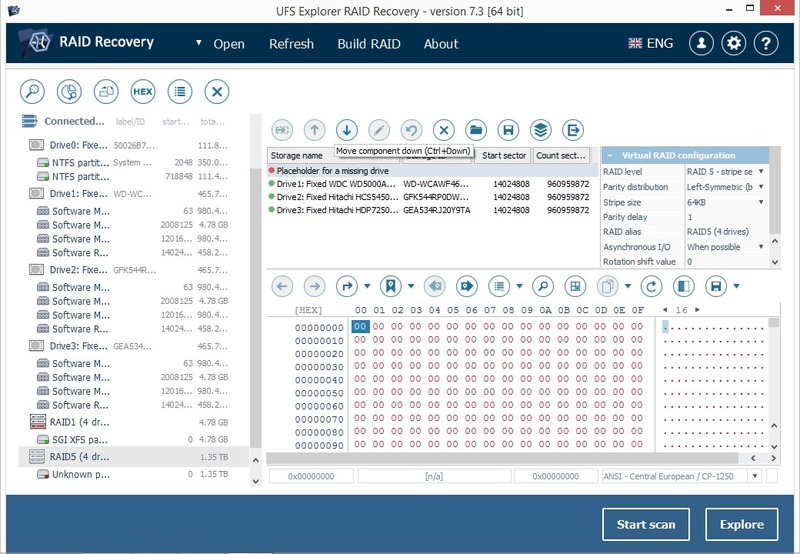 UFS Explorer RAID Recovery (RCI) was designed as an extension to UFS Explorer Standard Recovery software to expand its capacity for reconstruction of complex RAID-systems and for recovery of lost and deleted data from these systems. In addition to the set of functions contained in UFS Explorer Standard Recovery, this software includes an embedded RAID-Builder tool that organizes smooth operations on RAID-storages of any level. Modified p.6 of EULA (Territory). UFS Explorer RAID Recovery needs a review. Be the first to review this app and get the discussion started! UFS Explorer Standard Recovery for RAID (RCI) allows you to build, edit, and save virtual RAID configurations. Advanced software techniques enable building RAID systems not only from a set of physical disks, but from disk images as well. Moreover, the program has an embedded VIM-Import tool which allows the import of runtime-software virtual-image files (.vim) for further operations. Increased software convenience provides for effortless editing of RAID configurations. In addition, the software has an embedded hexadecimal viewer for brief data analysis on partitions and disks, which is essential for creating correct RAID configurations. You can save created RAID configuration to any selected destination as a file and later download it for further operations. The software manages loading standard RAID configurations as well as any configurations saved with UFS Explorer Professional Recovery version 3. Besides complex RAID-systems, UFS Explorer Standard Recovery for RAID (RCI) is applicable to other storage systems as well. You can, for example, recover lost files from your PC, USB flash drive, the memory card of your photo/video camera, external hard drive, virtual machine, or disk-image file with this tool. The software ensures the safety of your data by working in a safe read-only mode. This program doesn't require any prior technical skills, and thus is perfect for both home and professional RAID-reconstruction and recovery tasks.